by Bennett, Jeffrey O.; Briggs, William L.; Triola, Mario F.
This package includes MyLab Statistics. Understanding the core ideas behind statistics is crucial to everyday success in the modern world. 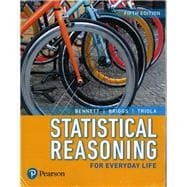 Statistical Reasoning for Everyday Life is designed to teach these core ideas through real-life examples so that students are able to understand the statistics needed in their college courses, reason with statistical information in their careers, and to evaluate and make everyday decisions using statistics. The authors approach each concept qualitatively, using computation techniques only to enhance understanding and build on ideas step-by-step, working up to real examples and complex case studies. The Fifth Edition has been revised to update many exercises, examples, and case studies to engage today’s students with the latest data and relevant topics. MyLab™ Statistics is an online homework, tutorial, and assessment program designed to work with this text to engage students and improve results. Within its structured environment, students practice what they learn, test their understanding, and pursue a personalized study plan that helps them absorb course material and understand difficult concepts. NOTE: This package includes a MyLab Statistics access kit created specifically for Bennett/Briggs/Triola, Statistical Reasoning for Everyday Life 5/e. This title-specific access kit provides access to the Bennett/Briggs/Triola, Statistical Reasoning for Everyday Life 5/e accompanying MyLab course ONLY. 1.4 Should You Believe a Statistical Study? FOCUS ON PSYCHOLOGY: Are You Driving “Drunk” on Your Cell Phone? FOCUS ON PUBLIC HEALTH: Is Your Lifestyle Healthy? FOCUS ON POLITICS: Who Benefited Most from Lower Tax Rates? FOCUS ON ECONOMICS: Can a Redefined CPI Help the National Debt? FOCUS ON HISTORY: Can War Be Described with a Graph? FOCUS ON THE ENVIRONMENT: Are We Changing Earth’s Atmosphere? FOCUS ON THE STOCK What’s Average about the Dow? FOCUS ON ECONOMICS: Are the Rich Getting Richer? FOCUS ON EDUCATION: What Can We Learn from SAT Trends? FOCUS ON PSYCHOLOGY: Are We Smarter Than Our Parents? FOCUS ON SOCIAL SCIENCE: Do Lotteries Harm the Poor? FOCUS ON LAW: Is DNA Analysis Reliable? FOCUS ON EDUCATION: What Helps Children Learn to Read? FOCUS ON THE ENVIRONMENT: What Is Causing Global Warming? FOCUS ON HISTORY: Where Did Statistics Begin? FOCUS ON LITERATURE: How Many Words Did Shakespeare Know? FOCUS ON HEALTH AND EDUCATION: Will Your Education Help You Live Longer? FOCUS ON AGRICULTURE: Are Genetically Modified Foods Safe? FOCUS ON CRIMINOLOGY: Can You Tell a Fraud When You See One? FOCUS ON EDUCATION: What Can a Fourth-Grader Do with Statistics?